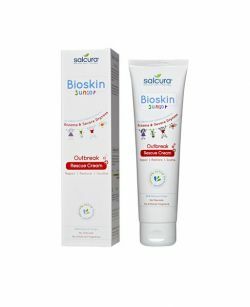 Suitable for skin that may be prone to eczema, psoriasis & dermatitis. 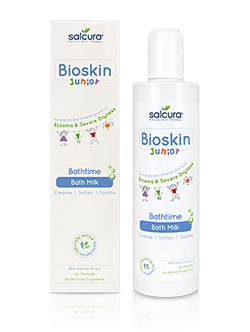 Bioskin Body Wash is a natural wash to gently cleanse the dry, itchy and sensitive skin whilst enjoying a shower. When suffering from dry, itchy and sensitive skin taking a shower can be an unpleasant experience, especially when living in an area where there is hard water. Water can further dehydrate the skin so it is important to use a Body Wash containing ingredients that help keep the skin stay nourished and moisturised. 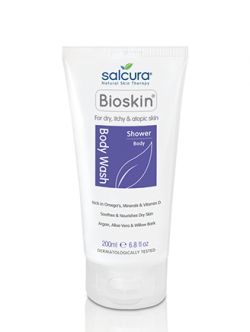 Bioskin Body Wash is free-from SLS, synthetic fragrances, parabens, paraffin, phthalates or lanolin, these products are low-foaming and kind to even the most delicate skins. Rich in Sea Buckthorn, Sunflower, Green Tea Leaf, Rosemary, Lemongrass, Sweet Orange, Jojoba, Borage and Pink Grapefruit. When suffering from dry skin, try and keep the shower on a luke-warm temperature as hot water can dehydrate the skin even further. Apply the Body Wash to damp skin and leave it on for a short while. Rinse off and use again if so desired. Be aware our Body Wash will not lather as much as you might be used to. 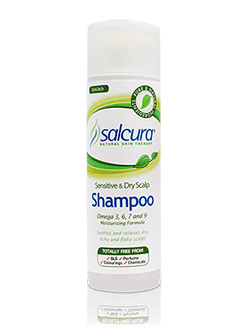 We use natural foaming agents which will create a lovely gentle foam when using it in the shower. Use in conjunction with other Bioskin products for maximum results.